When he was younger, Joseph had liked the stories that you like, and that I liked when I was your age, and that my father liked when he was my ... or rather your age, and that his father liked when he was my father's age ... or should that be my age ... no, in fact, it should be your age. No matter. The point is that Joseph used to like fairy tales. 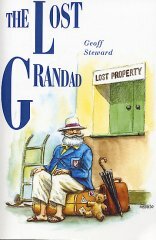 Stick with Joseph and his Lost Grandad - or maybe that should be his Found Grandad - and you can mind-travel with them to Australia, or somewhere a bit like Australia, and meet some really silly characters. 'Did I?' asked the Old Magic. 'How important?' asked the Old Magic. '... erm ... what? asked Dale, not knowing what they had got. 'Come on, Joseph, we've got ...' said Croc again, angrily this time.
' ... a lovely bunch of coconuts?' guessed Dale, still confused. 'Come on, Joseph, we've got ... ' said Croc, one more time.
' ... a lot of love between us?' tried Dale desperately.
' ... Come on, Joseph, we've got ... ?' said Dale hopefully.
' ... something to show you,' said Croc with relief. Actually, he needs a bit of practice as well, because his mind wanders on his first attempt and he crashes into the wardrobe door. So that's a rather hard lesson. You'll have to read the book for yourself to see exactly what kind of adventure they make of it. I think it will give you a laugh, provided you use your imagination. because of the encounters with weird and wonderful characters, but also because of the jokes, some of which are written for older readers and some for younger readers.